Thousands of women every day look in the mirror and are unhappy with their reflections – for a wide variety of reasons. As our eyes are “windows to the soul,” we need to make sure that they present the best possible front for everyone we meet during the course of the day. Family, friends, coworkers, bosses and total strangers form opinions of us (both positive and negative) by just a single glance our way. It is crucial to make that first impression a great one, so taking the finest care of our eyes is an important way to start. 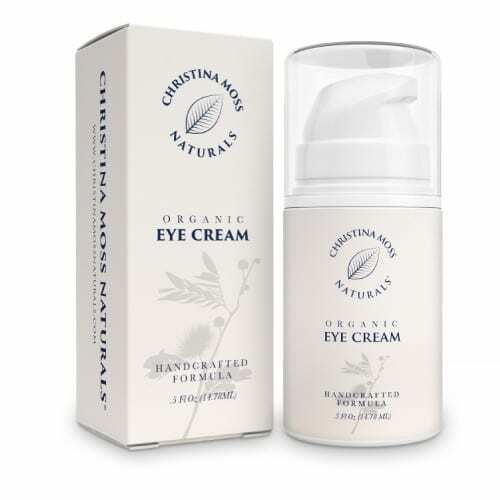 Organic Eye Cream by Christina Moss Naturals has everything you need to manage the fragile skin below and around your eyes, without leaving them dry or causing itchiness or redness like some products do. This premium moisturizer, made with natural ingredients, is perfect for using during the day and at night to address unsightly crow’s feet, dark circles from lack of sleep, dry patches and puffiness and water-retention due to allergies that seem to plague the eye area of most women. Specially formulated to be extremely gentle, unscented and completely non-toxic, this eye cream is absorbed deeply into the pores without clogging them or causing breakouts. It’s suitable for all skin types and is not oily or greasy upon application. So many of the eye creams on the market today tout their effectiveness without telling you about the harmful ingredients that make up their products. You don’t have to worry about that with any product produced by our company. We use only naturally-sourced elements that are of the finest quality, very responsible and extraordinarily effective. The unique formulation of organic oils and natural ingredients in our moisturizing cream ensures that you get a quality cream that works without harming your skin. We are proud to say that the ingredients in our moisturizer are never animal-tested and are made in the USA at a production center that is GMP certified and FDA registered for maximum safety and efficiency. You never have to worry about harming this area of delicate skin when using our eye cream. Leads to a brighter and more youthful glow – defy your age!